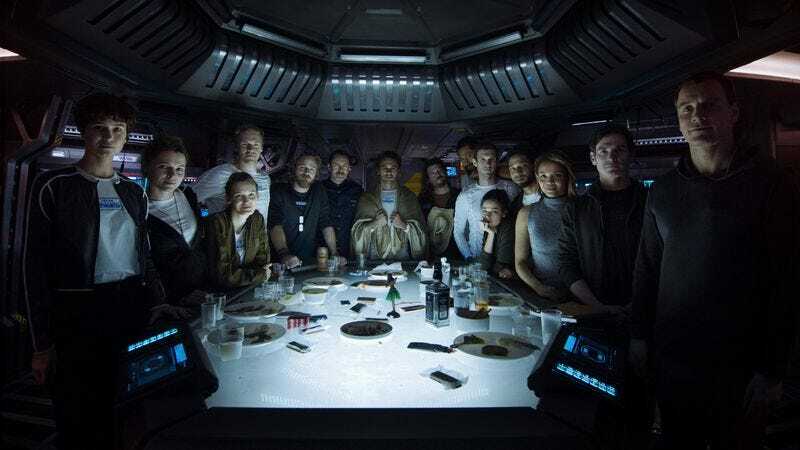 This morning, 20th Century Fox unveiled a photo of the crew of the Covenant, the ship that’s inevitably going to run into some trouble in Ridley Scott’s upcoming Alien: Covenant. It seems these space travelers just had a nice dinner, complete with some whiskey, and we even detect some smiles that will soon be wiped off their faces. The group is flanked by Katherine Waterston and Michael Fassbender, the latter of whom is back from Prometheus. Elsewhere, you can spot Billy Crudup, Carmen Ejogo, Jussie Smollett, Danny McBride and Demián Bichir. Notably, James Franco is prominently featured at the center of the image, draped in some sort of blanket, staring dead-eyed into the camera. That placement seems to indicate that, yes, Franco is indeed playing the captain of the vessel, as was previously reported. However, it’s also worth noting that in the first trailer Waterston refers to Crudup’s character as “captain,” and that Franco is said to have a small part in the film.